One of America’s classic board games, has been the Hasbro/Mattel word game of Scrabble. Created in 1948, the game quickly became a standard item in every household during family gatherings, holiday meals and birthdays. National competitions were as prevalent as spelling bees, during the initial growth of the game. Over the last 20 years, Scrabble was considered to be in decline and had lost favor, as mobile gaming systems grew in popularity. Advancements in the digital age, specifically in smartphone and tablet technology, have taken gaming to new heights. Having the convenience of playing a game on your smartphone creates even more opportunities than ever before. Zynga has introduced a series of games, dubbed “With Friends”, that harkens back to the golden era of family time and board games. Words With Friends has sparked a resurgence in its predecessor, Scrabble, to the point that tournaments and clubs are forming around the country. 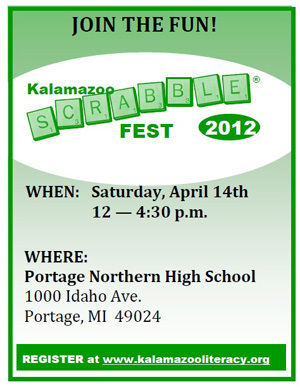 The Kalamazoo Literacy Council (Michigan) has seized an opportunity with the newfound popularity and is putting together its first tournament event, ScrabbleFest 2012. Anyone 16 and up can sign up for the tournament. The entry fee is $25 and proceeds go towards raising awareness for adult literacy in the area. For this particular tournament, there are only two categories – Competitive and Just For Fun. Each game has a one-hour time limit and the grand prize is a Kindle. Local restaurants and businesses have contributed gift cards, as prizes for runner-up winners. This is the second year of the event and the KLC is hoping for a better turnout, thanks to the popularity of Words With Friends. Over 30,000 adults in the greater Kalamazoo area can not read at a level high enough to help their children with homework, share bedtime stories or read notes sent home from teachers. Job applications and doctor’s forms are rendered useless and ordering a meal from a restaurant menu is problematic. The battle against literacy has been a struggle for the Kalamazoo Literacy Council for over 30 years now. The organization is run by volunteers and have 26 different locations that help those who struggle with literacy. The tutors who administer this program will also be involved with the tournament. Proceeds from this tournament will go towards supporting those locations, as well as training an addition 50 tutors. Gearing up for the tournament, you can visit : Scrabble Cheat or Words With Friends Cheat for tips, placement suggestions and more.